Here's a simple summer salad that can be put together in minutes. Prepare the dressing. Add to the salad & toss well. It’s raining awards in the blogosphere and I too have been given my very own award by dear Manisha of Indian Food Rocks. I am so happy! Thank you very much, Manisha, for the honour. The Power of Schmooze Award is for bloggers who "effortlessly weave their way in and out of the blogosphere, leaving friendly trails and smiles, happily making new friends along the way. They don't limit their visits to only the rich and successful, but spend some time to say hello to new blogs as well. They are the ones who engage others in meaningful conversations, refusing to let it end at a mere hello - all the while fostering a sense of closeness and friendship." This came as a real but very pleasant surprise to me as I have only been blogging for a little over a month. I am very glad that I am now a part of this online community of food bloggers. I love visiting other blogs when I get a chance, it is so much fun to read what others have to say /offer. Now, it’s my turn to spread the joy around! Hi... THANK U! !THANK U!! This is an honour!! Love u babe!! It feels so good to be a part of this wonerful world of blogging,so much to learn and sooooo much that gladdens the heart and motivates the spirit! 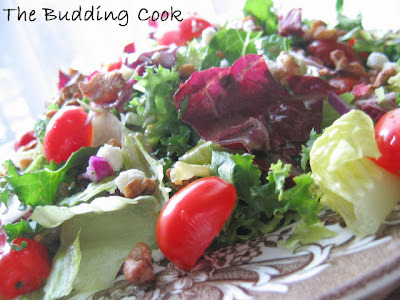 The salad looks wonderful.. must try! I am just learnign to appreciate salads... up until I stepped in to the blogosphere, I was a TOTAL junk food fan...see... i'm learnign already!!! A perfect summery salad TBC. Wish you a very Happy Independence day! Salad looks so nice n colorful! I wish I knew your name,TBC. Thank you very much for the award. I am really surprised and excited at the same time. Love the salad and happy independence day to you. Nice pics and a very pleasant template. That is one gorgeous salad...congrats on the award, and happy ID to you too. Congratulations!!! U deserve it and what a nice salad! Salad looks yum tbc. Great day today for us,huh? It;s fun to see all the flags and food co ordinated! Congratulations on your award! I love radicchio! lovely looking salad. wish you a happy independence day. congrats for the awards. I love your blog as well. The recipes and pictures I have seen so far are mouth watering! I can't wait to read on! Thats a great salad! Especially like the dressing. TBC, you're a schmoozer alright! And really the award has nothing to do with how young your blog is. You've more than made your presence felt and you've always done it in such a charming way! You definitely deserve the award! hey congrats for the award... great salad! Thank you for the award, my dear! It made my day :) That salad looks so refreshing! I was always a big rice -eater but have been trying to change my eating habits of late. Yes, it is, and so simple to make too. You are so welcome. Enjoy your award! You are welcome. You really deserve it! For now, TBC it shall continue to be:-)I am one of those super-paranoid people, u see. Hopefully the paranoia will wear off soon. I am already beginning to feel more comfortable around here. Thanks a whole bunch. You are too kind. Yeah, this day is beginning to mean more now than ever before. Being away from your country does do that to you. Thanks for stopping by.You are being too kind. Thank you very much:-). It is so nice to see you here again. You are welcome! And you know u deserve that award. It is nice tosee you here again. I had visited your blog hoping to seea new post but... Hope you get back to blogging something soon. You are such a sweet person. You do so much for the community & give back in as many different ways as you can . I am so glad that I am getting to know more about you through One Hot Stove. You are truly one of those who does make a difference & you are an inspiration to so many! A good salad is always a fresh breeze! Salad looks colorful, fresh and welcoming. Congrats for the well deserving awards. What s great looking salad. Congratulations on the award!! Your salad is looking delicious! Yes, it is! I am beginning to appreciate salads more these days. Thank you:-)You are so sweet. BTW, have u had a chance to try out the tomato-cucumber curry? Thanks for the encouragement & the appreciation. Congrats on all your awards. You deserve them! Just saw your comment on another site about how your folks were in Adyar. My hubby's family is still in Adyar, I love the place. And we used to stay with friends in R.A.Puram another lovely neighborhood! TBC, I am surprised you did not leave a comment in the festival event! There are no restrictions such as religion for the event. At the age of 46 I have learnt computers. It is only matter of time before I catch up with all of you on computer knowledge. and Thanks for passing it to me.I am really previleged. Salad looks nutritious. I really adore your photography. Yeah, I love Chennai even though I had lived there for only about 6-7 months. My parents were there for about 8 years. We have fond memories of our days in Chennai.My mom still misses Chennai a lot. They are now in Kerala . Wow! I had no idea! You rock!! !My mom is very scared of even going near a computer. The only time she does,is to dust it! Thank you for the invitation to participate. I will do my best but am not very sure as I have a lot going on. Seec, you are being very nice now:-)About the award, you really deserve it.In spite of your busy schedule you take the time to visit new blogs. You were one of the first ones to encourage me by leaving comments. I really appreciate it! When you say nice things about my photography, it really makes me feel so good. BTW, I will get to your meme soon. I had to come back here to check your dressing, I love dressings! I have some blue cheese in my fridge, I think that will do to top the salad! Thanks!